The Kodak Super 8 Camera is a modern day chimera of analog and digital made for the budding movie maker or even artists who want their indie films to have a nostalgic feel. It combines the best features of cameras from the past with the convenience of modern filmmaking. It was first introduced by Kodak in 2016 and is due to be released to consumers in May 2017. Though its original street date was delayed by a year, the newest version has many features that were unavailable on the prototype, such as an easy-to-access menu built right into the body. The large, 3.5 inch LCD screen allows the filmographer to easily keep an eye on what he is shooting. The Kodak Super 8 Camera is almost fully customizable, allowing the user to choose settings with the touch of a button. Those settings include frame rate, shutter speed, and adjustment of the manual focus. The sound is recorded to an SD card then added to the film post-production. An external monitor can be added thanks to the built-in HDMI port; the Super 8 Camera also has input/output jacks for recording audio. It comes with a standard Ricoh 6mm lens, though almost every lens from older C-Mount 8mm cameras can be used on it, as well. A simple adapter can widen the lens variety from other brands, making this new camera highly adaptable to any amateur director’s vision. The film for the Kodak Super 8 is a throwback to earlier days, with a twist. It is purchased as a 50-foot cartridge that slips easily into the camera’s body. The Super 8 can be adjusted to shoot at a range of 9 through 36 frames per second and a single cartridge gives two to four minutes of a film, depending on how fast the camera is set to shoot. A built-in rechargeable battery generally lasts between 12 and 15 cartridges. Kodak began producing movie film early in the heyday of the silver screen. From the 1930s to the 1950s, movie film was 16mm and took a good deal of practice handling for it to work properly, before and after it was developed. 16mm film had to be put through the camera to be exposed on one side, then pulled and put through to expose again on the other side. It was then sent to a lab for processing, part of which involved cutting the film in half and splicing it together in order for the finished product to be 50 feet of finished 8 mm film. For this reason, movie cameras were uncommon except for actual filmmakers and camera buffs. The idea of taking movies at home was inconceivable to most people. However, in 1965, Kodak changed all that with the introduction of “Super” 8mm film. The film was stored in a plastic cartridge that made it easy for anyone to load into their camera. It would not jam and the entire roll could be shot without stopping. The Super 8 Cameras of the time were made with a battery-powered motor instead of the hand-crank found on older models. In 1973, Kodak’s 8mm film had a magnetic strip added in order to record sound. The era of the home movie had begun, and its popularity has never really waned, only the mechanism by which videos are taken has changed. For example, the use of videotape overshadowed 8mm in the 1980s and Kodak ceased production of it in the early 1990s. Until now. When a cartridge is purchased for the newest Super 8 Camera, it includes not only the processing but also access to the online Kodak Darkroom. The entire film is available in the Darkroom as scans and can be used in whichever way the filmmaker sees fit. Kodak Super 8mm film is available in color or black and white; sound-enabled or silent. Kodak Vision 3 film cartridges may be purchased directly from Kodak or on Amazon. As of Spring 2017, only the 50-foot cartridges are available. 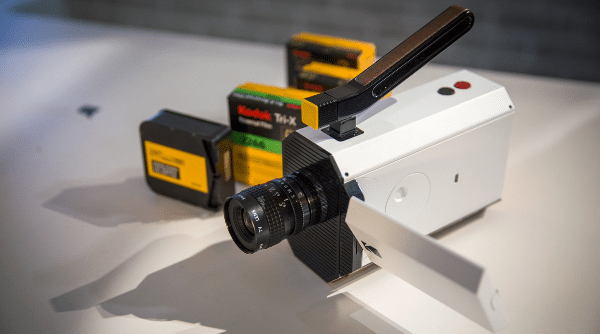 The new Kodak Super 8 Camera is gearing up to be more than a nostalgic way to make home movies, it may just bring about a new generation of movie makers. ← Anker Soundcore 2 vs Bose SoundLink Mini 2: Which Smart Speaker Should You Buy?